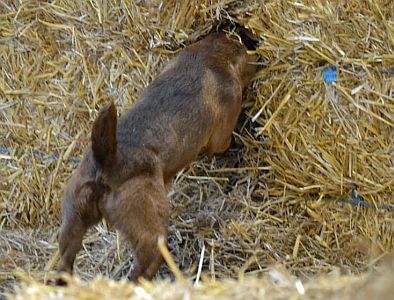 The purpose of Barn Hunt is to demonstrate a dog’s vermin hunting ability in finding and marking rats in a “barn-like” setting, using straw/hay bales to introduce climbing and tunneling obstacles in the dog’s path. Barn Hunt is based on the skills historically used by itinerant “ratcatchers” in traveling the countryside, ridding farms of vermin, thus helping conserve and preserve food grains and cutting down on disease.While ratcatchers often used breeds such as Jack/Parson Russell Terriers, they also used other non go-to-ground breeds such as Manchester Terriers, Rat Terriers, and a variety of breeds and mixes of small to medium size. Some breeds have never had an officially licensed test which truly emulates their traditional working task. Barn Hunt will fill that role.Barn Hunt is also for any breed or mix of dog who loves to hunt and who can fit through an 18” wide gap between two hay bales. It will test speed, agility, and surefootedness. While not specifically targeted at larger dogs or dogs without a vermin hunting history, Barn Hunt is all inclusive and fun for any dog and human who wishes to play the game. Barn Hunt Association LLC title-holders can submit a copy of their Barn Hunt title certificate, the official UKC application, and the $20 recording fee, to have the title recorded on the dog’s United Kennel Club record. They will receive a title certificate recognizing their dogs’ accomplishments. Certificates will only be issued for Barn Hunt titles earned after January 1. Barn Hunt titles earned prior to January 1, 2014 will not be grandfathered in.